This project idea was conceived by Aishwarya Hebbar, Final year B.Com student of PES degree college and supported by Anup Vijaykumar, 3rd year EEE student of SKIT. The idea is about reusing the used pens by replacing the old refills. The main motto behind this idea is to prevent product, plastic and technological waste. This project is supported by World Merit-India. World Merit is an international platform where one can connect to amazing people working for various social causes from all around the world. It was founded in U.K by Sir Chris Arnold. World merit is expanding globally and it has started spreading its roots in several different countries including in our own India. This project is powered by a trust by name IU CARES FOUNDATION founded by Mr. SUJIT LALWANI who is also the Director of World Merit-India and the mentor for World Merit-Asia. It supports many social projects which can create positive social impact. On January 3rd, IU CARES FOUNDATION supported the youngsters behind LWT project to create a massive social impact. The World Merit India Council (WMIC) members supported and organized LET’S WRITE TOGETHER project in 4 government schools of Bangalore. The event was a grand success impacting 1220 students. The execution of this happened on January 3rd in three different areas of Bangalore: Govindarajnagar, Bannerghatta road and Rajarajeshwarinagar. 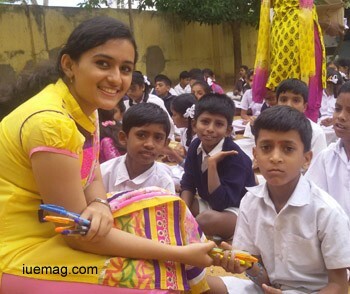 Around 6100 used pens were collected in 2 weeks from various schools and colleges of Bangalore and were refilled with new refills. The schools impacted where the pens were distributed were Govindarajnagar Government Higher Primary School, Sri Rajeshwari Vidyashaala Higher Primary School, Government Primary School, Gottigere, and Rotary High School in Gottigere. KAVYASHREE MR, Member of WMIC and Founder of E4U (Electronics for You) project says, “Sharing knowledge with the government school children is an experience every youth must experience”. Around 20 volunteers namely, Soundarya R from RRCE, Bharath Kumar NJ from AMCEC, Amit Pandey from Jain University, Laila Sonu from KIPT, Chandrashekar from AMCEC, Abhilasha R from VKIT, Arpita NS from Dr. AIT, Madhusudan from Sambhram institution, Suraj HM from MBA, DBIT, Vinayaka KC from KSIT, Vishwesh Wali from GSKSJTI, including team leaders took active participation and made this event a grand success. The team of WMIC members and all volunteers wish to thank Sri. Priyakrishna, MLA for Govindarajanagar constituency, teachers, management different institutions, students and citizens of Bangalore, who supported this wonderful cause. It was found out that not only children who got the pens were happy but the happiness was stretched out to the students who distributed them too. Every volunteer was filled with contentment for being a part of such a great event. Any facts, figures or references stated here are made by the author & don't reflect the endorsement of iU at all times unless otherwise drafted by official staff at iU. This article was first published here on 3rd January 2015.